REA Technologies, Technical Services To Save You Money. CLICK HERE TO CHECK OUT SOME RECENT SUCCESS STORIES TO SEE HOW REA CAN INCREASE YOUR UPTIME, IMPROVE THE QUALITY OF YOUR PRODUCT AND MOST IMPORTANTLY, SAVE YOU MONEY! intermittent issue troubleshooting, and industrial electronic service. Need to be back in production ASAP? Need to be more efficient and cost effective? Let REA Technologies save you time and money! From coast to coast or around the world we are your source for Industrial repair and service. We repair all types of machinery… electronic, hydraulic, pneumatic, and robotic. Our most common in-house repairs such as drives, motors, controllers, etc. are expertly serviced in our North Carolina facility. Our ON-Site Technicians are proficient in multiple industries such as Woodworking, Metalworking, Textile, Automotive, Plastics, and Food processing, to name a few. Simply contact us to discuss your needs. Do you need a hard to find or obsolete part? Call us or send us an email and we will do our best to locate the part you need inexpensively, and fast! Repairs can be made at a small fraction of the purchase price of new equipment. When your equipment is down… you are losing money. We understand that time is money! We offer 24/7 service to get you back in production. Our skilled service technicians can trouble shoot, diagnose and repair your machinery on site. This service is convenient for equipment that is too large to ship, but also has other great benefits. Our technician will be able evaluate the entire machine and determine the efficiently of the machines working together within your facility. Not only will you be up and running, but you may also enjoy a smoother running, more productive operation. Turn around time and cost vary on repairs can vary but typically your item is returned to you in full working order within 7-14 days. For those “emergency” situations, we also offer ASAP/priority service and next day shipping. Do you want a QUOTE? Of course you do. We do not believe in “guessing” at what may be wrong with your equipment and giving you a flat cost. All “failures” are not created equal. To quote a flat fee a company must raise the price of all repairs to make up for the few that may be priced too low. Be assured that when your repair is evaluated and a written quote is given, you are receiving the lowest cost available to have your equipment back in supreme condition. Send us an email and we will try to help you! But what about Service and Quality? We pride ourselves or our superior repair abilities most any type of industrial equipment. You can be confident that we have the experience and dedication need to complete your repair. We are so confident in our abilities that we offer a 12 month warranty and pricing that is a fraction of the cost of replacing your unit. We will never give you a “flat” quote. We don’t believe we should overcharge everyone to make up for a few quotes that may be priced too low. So what do we do? We examine, evaluate, and then provide a diagnosis and written quote. You will never be surprised… just impressed. Contact us to discuss your specific needs. When your item arrives at our facility, it is logged in and assigned to a project leader. He/she will oversee all aspects for your repair from the initial quote to shipping. First, your item will be evaluated. We examine all aspects… not just what you are reporting to be the problem, but the unit as a whole. We believe we need to understand WHY you had a failure. Could it happen again? Were other components damaged? Although the cost of a repair is significantly lower than purchasing a replacement, the cost of repair can vary. A written quote will be emailed to you within 3 days. Please contact your project leader with any questions. Once we get your “OK” your item will be assigned to one of our skilled service technicians. Every effort will be made to have your item back to you within the shortest amount of time possible. Your project leader will keep you advised of the progress of your repair. Remember, for those emergency situations, we offer ASAP/Priority Service and Overnight Shipping. 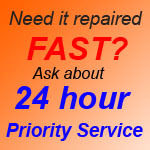 We offer a 12 month warranty on our repairs. Although we seldom have issues, you can rest assured that we not only “talk” of our abilities, but we back them up! The designated brand names and trademarks described on this website are the property of their respective owners.